The political landscape in Sri Lanka is always in a state of flux and the week past was no exception, with developments in the opposition hitting the headlines. Wimal Weerawansa of the Jathika Nidahas Peramuna (JNP), whatever his faults, is a clever politician. He has the knack of converting any event to his advantage and this is what he did when he was detained and remanded on charges of misusing state property- over forty vehicles- which he allegedly distributed among family, friends and party officials. Weerawansa complains that he is the victim of a political witch-hunt. That is ironic because a few months ago, he was claiming that the government had been unable to prosecute corrupt politicians in the former regime and challenged the authorities to do so. Now that he finds himself in the middle of a muddle, he is crying foul. However, Weerawansa is not one to let such an opportunity slip by. He mobilised his party workers to be present when he was detained. They created a scene there. That was propagated through social media. Now, a series of posters have sprung up, hailing him as a hero. Weerawansa knows that for someone with a short political stature such as himself, any publicity is good publicity, so he is making the most of his fifteen minutes of fame. It is the Lemon Puff death fast opposite the UN- all over again! Another interesting development over the past week was parliamentarian Athuraliye Rathana Thera’s announcement that he would function independently in Parliament. Rathana Thera was a livewire in the Jathika Hela Urumaya, led by Minister Champika Ranawaka. He too exited the Rajapaksa government, when Ranawaka defected to the Maithripala Sirisena camp at the 2015 presidential election. The vagaries of politics are such that he was nominated to Parliament at the 2015 general election from the National List of the United National Party (UNP). Once a firebrand politician known for his forthright views and for expressing them forcefully, Ven Rathana Thera has kept a low profile in recent times. He obviously has some differences of opinion with the authorities but, despite functioning ‘independently’ he is not about to get on a platform to lambast the government. In fact, he clarified his stance, saying shortly afterwards that he will “support and work for the government and will only make constructive criticism on some matters”. 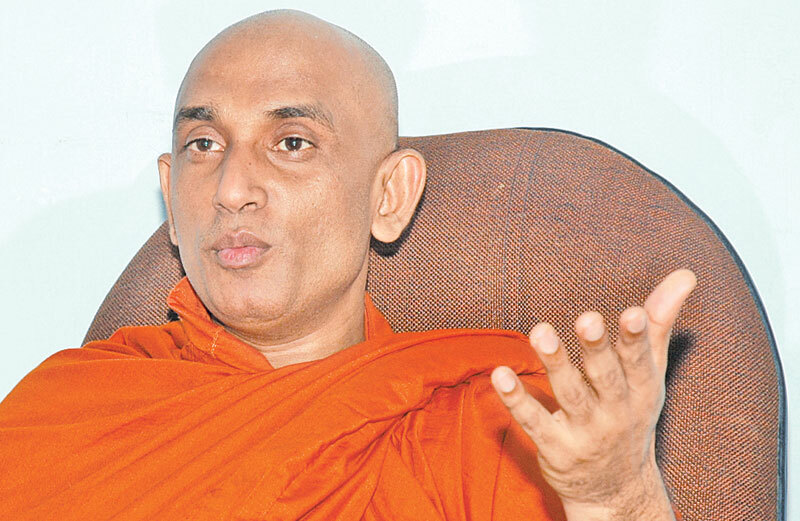 There was some speculation that the UNP will consider removing Rathana Thera from Parliament and replacing him with one of their own, but this is highly unlikely at this time. Despite his decision to function independently, Rathana Thera is known to retain cordial relations with both President Maithripala Sirisena and Prime Minister Ranil Wickremesinghe. Another ‘opposition’ politician to make a move was Piyankara Jayaratne. The Puttlam district parliamentarian, a former Deputy Speaker, had recently resigned from his portfolio of State Minister of Local Government and Provincial Councils saying he wanted to work in a ‘Sri Lanka Freedom Party (SLFP) only’ government. At the time, his resignations raised many eyebrows. There was even speculation that more state ministers would resign. That did not happen. This week, Jayaratne chose to sit on the opposition benches in Parliament. Jayaratne was seen walking into the chambers flanked by some Joint Opposition parliamentarians. There is every indication that he would announce his decision to support the JO shortly. If that happens, the Rajapaksa faction would command the support of 52 of the 95 parliamentarians elected under the United Peoples’ Freedom Alliance (UPFA) ticket at the last general election. By far the most interesting development though was the meeting provincial Chief Ministers had with former President Mahinda Rajapaksa a few days ago. The meeting was thought to be crucial, especially in view of the upcoming Local Government elections. There is an influential section within the Sri Lanka Freedom Party (SLFP) which believes that the support of the former President is critical, if it is to succeed at the local government elections. This is not because Rajapaksa’s popularity is on the crest of a wave of popularity. Rather, it is because he has packed Local Government institutions with his loyalists over the ten years that he was in office. These local councillors have held sway at the grassroots level for a decade and the ‘name recognition’ factor works heavily in their favour, especially at a village level. The anxiety among a section of the SLFP is that these councillors who are loyal to Rajapaksa and not to the SLFP, could be returned to power at local government polls- and that would provide the impetus for Rajapaksa’s next move. The Chief Ministers, obviously keen to test the political waters and bring about a rapprochement between the President and former President, if that was possible at all, sought President Sirisena’s permission to meet with Rajapaksa. Permission was readily granted but President Sirisena did not put any offers on the table. There was no invitation for Rajapaksa to return to the fold- although, technically at least, he still hasn’t left it-and there were no deals on offer. The six Chief Ministers want the former President to abandon plans to field separate lists at Local Government and Provincial Councils polls on the Sri Lanka Podujana Peramuna (SLPP) ticket as they feel it would hamper the prospects of the SLFP, with the UNP being the ultimate beneficiary. From Rajapaksa’s perspective, local government polls are ideally suited for his purpose: it is a local election and not a national poll, so he does not need to run. He can let his nominees run, cheer them from the sidelines, see how they perform and gauge their- and by extension, his own- popularity, without ever having to leave the SLFP. Predictably, the talks ended inconclusively. Rajapaksa gave the chief ministers a lecture on the reasons why he couldn’t support their cause. He claimed he was being targeted in a political witch hunt and that the SLFP was being betrayed by cohabiting with the UNP in government. The comments by the two factions after the meeting were interesting. The JO was keen to suggest that the talks were a failure and were unlikely to succeed in the future. On the other hand, the Chief Ministers who attended acknowledged that there were differences of opinion but said discussions would continue. Obviously, both sides are playing to the gallery. While some in the SLFP may entertain some anxieties about the outcome of the Local Government elections, the party hierarchy is not so concerned. Whatever the outcome of the local government poll, it does not alter the balance of power in the country. It is also three years away from the next national elections, so it is not likely to give rise to a tidal wave of support for Rajapaksa that could be sustained over a period of several years. However, what it could do is create an impression that Rajapaksa does command significant support among the masses and give the former President the courage to take the plunge and join the newly created Sri Lanka Podujana Peramuna (SLPP). For all his political bravado, Rajapaksa has refrained from doing so. He does feel a sense of attachment for the SLFP, the party he nursed for forty five years and led for ten years. He also has concerns as to whether a brand new political party, even with himself at the helm, could take on the established SLFP which is entrenched in the hearts and minds of the average citizen who supports the party. Rajapaksa will rely on the Local Government elections to provide him with an answer to that question and that explains why he was mostly negative and lukewarm to the suggestions forwarded by the Chief Ministers. The local polls therefore are a tussle within a tussle – a battle of wits between the Sirisena and Rajapaksa camps of the SLFP, each vying for supremacy and control of the party, while the UNP looks on, not displeased at the shenanigans of its historical rival.